Pam Scott was a forensic scientist at Victoria Police in 1993 when DNA evidence led to a manslaughter conviction in a high profile cold case in Tasmania. Taxi driver Gerald Highland had raped and killed 23- year old Amanda Carter in 1980, but there wasn’t enough evidence to charge him at the time. But 14 years later, advances in DNA technology identified him as the killer. “We were all watching the case with interest,” said Ms Scott. Pam joined Forensic Science Service Tasmania (FSST) 18 years ago and has been Manager of Forensic Biology for the past decade. While some forensic techniques have remained the same over the years, the process of identifying or ruling out people of interest has changed dramatically. “When we used ABO blood group testing to make identifications we needed a blood sample the size of a 20 cent piece. We can now get a DNA profile from a sample that you can’t see without a microscope,” said Ms Scott. And a successful result from a blood test was a 1 in 100 result. Now it’s one in millions or billions. A passion for investigation has kept Pam in forensics for almost 30 years. But the work is often confronting. “When we go to murder scenes, if you think about what the victim has gone through you can’t do the job. You have to be able to compartmentalise it,” she said. The work of the FSST is not only invaluable to investigators in securing convictions, but it provides outcomes to families when human remains are identified and also excludes people who are suspects. 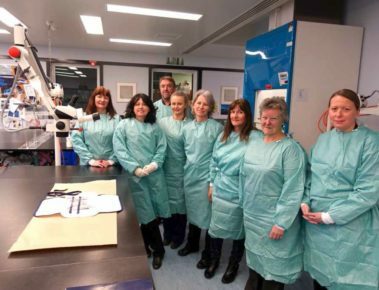 Above: FSST Forensic Biology team: Jane Devenish-Meares, Ana Flonta, Paul Holloway, Phoebe Carter, Rebecca Towers, Marie McCusker, Pam Scott, Rebecca Cook. This page -- https://www.police.tas.gov.au/about-us/100-years-women-policing-tasmania-police/civilian-women-tasmania-police/behind-the-microscope/ -- was last published on February 13, 2018 by the Department of Police, Fire and Emergency Management.